>> Nikon Coolshot Laser Rangefinder Reviews-Which is Best? 1 How does the Nikon Coolshot Work? 2 Is the Nikon Coolshot Easy to Use? 3 What is the Pinseeker Function? 4 Which Nikon Coolshot is the Best? 9 The Nikon Coolshot AS-Unbeatable Value for Money? Our Nikon golf rangefinder overview and reviews below will help you pick the perfect tool and enable you to take strokes off your game! How does the Nikon Coolshot Work? The Nikon Coolshot works by utilizing high-quality Nikon lenses to scan the field of vision. As the camera pans through the images being inputted into the computer, a laser is simultaneously shot with the image and picked up by the camera. The delay between when the laser is sent out and then returned to the camera is translated into distance by the Nikon’s computer. The Coolshot will then give the user a digital, real-time readout displayed within the viewfinder. Is the Nikon Coolshot Easy to Use? The Coolshot is as easy as “point and shoot” and as you know from my current rangefinder choice, I am all about “easy.”It is small enough to fit in the palm of your hand. Controls are located at the top of the device for easy, one-handed use. Simply look through the monocular viewfinder and either point the Coolshot at a specific target, or pan the device to receive a spectrum of distances. The various models offer six times magnification so that you can easily zoom in to select even small targets from a long distance. Nikon specifically designed this device to be extremely user-friendly so that no technical knowledge was needed and that even those who might have difficulty with digital instruments can easily use and benefit from the Coolshot. What is the Pinseeker Function? The Pinseeker function, also known as “First Target Priority,” is perhaps one of the best features of the Nikon golf rangefinder. One problem that general rangefinders have is zeroing in on a specific target. Now, if you want to know the exact distance between you and the hole, getting your rangefinder to specifically target an object as small as the flag might be impossible. This is where a rangefinder specifically designed for golf is necessary. With the Pinseeker function, the Nikon Coolshot can identify the flagstick from hundreds of yards away even against a background with multiple targets, like a forest. Simply point the Coolshot at the pin and the device will automatically identify the pin and give you an accurate reading so that you can select the perfect club for the shot! Which Nikon Coolshot is the Best? Nikon makes three different versions of their Coolshot. Below we consider the different features offered by each model in order to help you find the perfect model to fit your needs. The Coolshot 20 is Nikon’s basic level golf laser rangefinder. Like all the Coolshot devices, it is compact (about 4.5 ounces) and fits ergonomically in the palm of your hand. It is accurate from 6 to 550 yards, so its range is good for the average player. Within this range, the Coolshot 20 can use its First Target Priority (i.e., pinseeker technology) to exactly target the flagstick. If you can see the target, you can know how far away it is without any difficulty. Or you can press a single button and scan the horizon for up to 8 seconds to get speedy measurements for a variety of targets. This helps you get a feel for the “lay of the land,” and any obstacles that might be in the way. If you are familiar with Nikon cameras, you know that Nikon makes some of the highest quality lenses in the business. They bring this same technology to their laser rangefinders with precision lenses that provide some of the brightest and clearest images you could ask for. The optics in the Coolshot 20 and other devices will not have you squinting to make out the course or find the flag. The Coolshot 20 is also rainproof, so there is no need to worry about damaging the rangefinder should you find yourself in a downpour. Nikon has also included a wriststrap and a carrying case to protect your rangefinder. Included with the Coolshot 20 is 1 CR2 battery. Though the battery life is quite long since the rangefinder does not need continuous use, it might be a good idea to keep some spare CR2 batteries in your golf bag, just in case. Like the Coolshot 20, the Coolshot 40 offers a compact, rainproof, high optic rangefinder with First Target Priority. In addition to these great features, the Coolshot 40 adds 100 yards to your measurement capabilities (from 8 yards to 650 yards). According to tests, the Coolshot 40 is accurate within 2.25 feet. It also comes with Nikon’s special “Hyper Read” technology which ensures these accurate measurements within .5 seconds no matter how far away the target is. The Coolshot 40 is a good rangefinder for those wanting all the features of the Coolshot 20, but also wanting a little extra distance. With the Coolshot 40i, Nikon has taken their laser rangefinders to a new level. The Coolshot 40i comes with all the features of the Coolshot 40, but with one game-changing addition. Golf courses are rarely level and changes in slope can affect the way the rangefinder calculates the distance to the flag. The Coolshot 40i adjusts for these differences in elevation. With Nikon’s ID Technology, this laser rangefinder will calculate, display, and adjust for changes in slope. No golfer should be uncertain about the distance to the hole. The Nikon Coolshot series is just the right companion every golfer needs to ensure proper distance measurement and club selection. 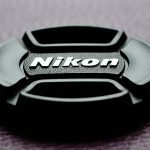 All Coolshot models come with a 2-Year warranty so you can be sure Nikon will back up their product if it should fail. This should give every golf piece of mind that their investment in a Nikon Coolshot will be sound. Over the last couple of months, we have been playing around with all sorts of gps devices as well as rangefinders. Whilst there is some really good stuff out there, we found ourselves coming back to one particular model, the coolshot AS. This isn’t the latest model (although it is certainly fairly up to date) but it just offers such a solid combination of price and performance that make it such a good deal. The Nikon Coolshot AS-Unbeatable Value for Money? Have you been trying to find the best Nikon Rangefinder for your next golf game this weekend with your business partners? Many avid golfers probably went searching online for the best Rangefinder from Nikon only to find that there were so many models available! Which one would be easy to operate and still get the job done? Which model would be reliable but doesn’t cost anything near you clubhouse membership? There have been many Nikon models over the years, but there’s something about the older ones that have all the features you need at a bargain price. Take for example the 2014 Nikon Coolshot AS Laser Rangefinder. In spite of being an older model of the more recent 2016 40i Laser Rangefinder, this high-tech Nikon Coolshot AS is still a favorite among golfers simply because it boasts a built-in golf mode that is rigged to help you in your game. The ID (Incline/Decline) technology was developed to help golfers who aren’t always playing on the flat driving range. The golf course as we all know has many random slopes, and one of the primary functions of the ID technology is to quickly measure the slope distance for your next shot. This certainly takes a lot of burden off of having to rely on intuition. You can focus your golf instincts more to making an appropriate swing at the best angle. By using this setting, you are then able to calculate the right angle you need to hit the ball towards even though the terrain ahead isn’t flat. Whether the next shot you need to make is an uphill shot or a downhill one, the Incline/Decline Technology in the Nikon Coolshot AS will give you a very accurate slope adjusted distance measurement that can also help you decide on the best golf club you should use. Lowering your score during a Golf game on the course and avoiding that big number becomes an easy practice. You will have no problem with training yourself to experiment with different clubs and swings to get a trajectory that can cover a certain distance and terrain situation. 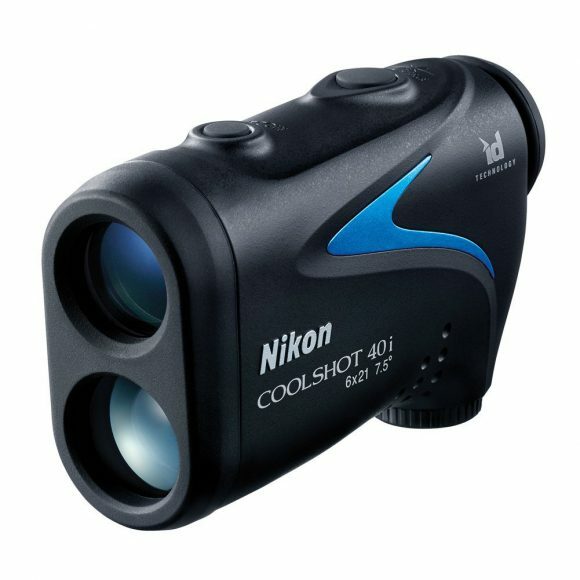 You can use the Nikon Coolshot AS to be an essential training tool for continuously measuring the different personal distances you get from the various swinging techniques and golf clubs that you use. Figuring out the distance for your next shot might need some getting used to, but it is just a click of a button away. Clicking on the ranging button will give you 8-seconds of continuous measuring. This feature ensures that the initial camera-shake people usually make when pressing a button doesn’t affect the measurements. The feature will also let you have a bit of time to move the Nikon Coolshot AS around until you have locked in on your target using it. No distance is too long for the Coolshot AS Rangefinder. It can help you to get per half-yard measurements of targets that are up to 600 yards away, a distance that is long enough for the average golfer to make between shots. This precision won’t disappear even though you are facing an uphill slope, a downhill slope, a dogleg, a hazard, or any other spot in the course. Again, the angle-compensated distance reading feature that it boasts is especially helpful for those times when you are going to do a long distance shot. At only 6 and a half ounces, this Nikon AS Rangefinder is one of the lightest in its category. It comes with a casing and can easily be strapped to your back or belt and falls into the list of must have equipment in your golf bags. The size of the product is very practical and doesn’t need much space in your already massive golfing gear. The weight doesn’t weigh you down either after carrying it through an 18-hole game. The device is also protected by a waterproof body made to withstand rain and splashes of water. 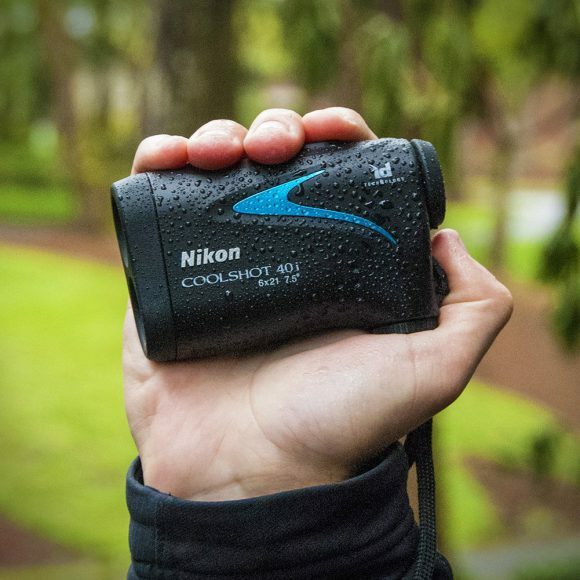 You might not be turned on by playing golf when it’s pouring wet, but this feature does give you peace of mind knowing that a bit of water won’t stop the Rangefinder from providing a reliable distance reading. Nikon claimed that the CR2 lithium battery that comes with this Nikon AS is usable and rechargeable up to 13,000 uses. When fully charged, the battery power can withstand 18-holes without having to be recharged, which by the way is another reason why the Coolshot AS offers more value for money when compared to other brands on the market. But there is a small trade-off. To save energy, the Nikon AS also has an automatic off feature that will turn the device off when you haven’t used it for a certain amount of time. Carrying all the features of the same class of premium Laser Rangefinders, the Nikon Coolshot AS has one of the lowest prices in comparison with other Rangefinder brands. But as you have read so far, the low price point doesn’t compromise quality, and this model is certainly one of the most affordable. Being at the lower end of the pricing range is also a good thing when you are just starting out using a Rangefinder to improve your game. Rather than jumping on to the most expensive model, choosing Coolshot AS can be a good start. Even after diving into the many features and benefits of using the Coolshot AS in your golf games, let’s also remember how recognized Nikon is for producing devices that have high-quality optic and camera technology. That same quality can also be expected in their Rangefinder models, making the Nikon Coolshot AS no exception. Attention to Golf players has made Nikon committed to producing a range of Rangefinder products that are designed specifically with the golfer in mind. Nikon Coolshot AS is a worthy consideration, whether you are a beginner or already a seasoned pro.